Whether you live in the Capital Region or are just in the area for the holiday season, planning for your Thanksgiving feast can be a hassle that will put a damper on your festivities. Fortunately, you don't have to go through all the fuss of preparing your own holiday meal this year since many restaurants in Washington, D.C., Maryland, and northern Virginia will be open on Thanksgiving Day. From prix fixe feasts to turkey a la carte, you can find something to satisfy every taste palette and budget this holiday year. Whether you want to enjoy your Thanksgiving meal out or you'd rather order turkey to go, these restaurants in the Washington, D.C. area offer a wide variety of selections in 2018. Top Picks for Dining Out in Washington, D.C. If you're planning to celebrate the Thanksgiving holiday in the nation's capital, you'll find plenty of exciting events like the Turkey Trot to keep you entertained, but once you're ready for your holiday feast, you'll need to find a great restaurant that will be open during the special day. Fortunately, many D.C. restaurants are serving a special feast in honor of Thanksgiving in 2018. 10 Thomas Restaurant (Washington Plaza Hotel): Here you'll find a traditional Thanksgiving menu, featuring herb-rubbed, slow-roasted turkey, honey-glazed ham, traditional stuffing, cranberry sauce, green beans, mashed potatoes, and pumpkin pie. ($45 per adult; $22.50 for children under 12; served from noon to 8 p.m.). 14 K Restaurant: Choose between a Thanksgiving brunch in the early afternoon (11 a.m. to 3 p.m.) or a full holiday feast in the evening (5 to 10 p.m.). BLT Steak DC: Served family-style, the holiday meal will be available as a prix fixe tasting menu including starter, entrée, sides, and dessert options. Bourbon Steak: Located inside the Four Seasons Hotel in Georgetown, this restaurant will offer a special three-course menu for Thanksgiving. Carmines: The legendary New York City family-style Italian restaurant offers a hearty feast with all the trimmings—and you can either eat in the restaurant or have it delivered to your home or hotel, even on Thanksgiving. Central: The restaurant will feature three-course prix fixe Thanksgiving Dinner that is both quintessentially American and a little French. Del Frisco’s Double Eagle Steakhouse: The three-course Thanksgiving meal includes updated holiday favorites like butternut squash soup, slow roasted turkey breast with sweet onion apple-sausage stuffing, and pecan pie à la mode for dessert. Georgia Browns: Celebrate Thanksgiving family style with turkey and all the fixings served with Southern hospitality. The Hay-Adams: The historic Hay-Adams restaurant offers guests one of Washington's most prestigious addresses, featuring views overlooking the White House, Lafayette Square, and St. John's Church (the "Church of the Presidents"). For Thanksgiving, you can enjoy a prix fixe traditional holiday feast or order a la carte. Lincoln Restaurant: At this historic restaurant, you can choose selections from the a la carte menu, including fall inspired soups and salads and a selection of handcrafted desserts. The Mansion at O: You can enjoy a Thanksgiving feast and access to this famous D.C. attraction for just $70 per person (kids under 5 are free). After your traditional turkey-and-stuffing holiday meal, you and your family can explore over 100 rooms featuring over 70 secret doors at this prestigious mansion. Rasika: You can enjoy Rasika's specialty holiday dishes from a prix fixe or a la carte menu at either of this restaurant's two D.C. locations (Penn Quarter and West End). Spirit of Washington: Take a cruise along the Delaware River by departing with Spirit of Washington from Pier 4 at 6th and Water streets. While relaxing on the water, you can enjoy a three-course buffet-style meal along with dancing and spectacular views of the sites of the city. Other Restaurants Open in D.C. on Thanksgiving: 1789 Restaurant, 701 Restaurant, Ardeo+Bardeo, Art and Soul, Bibiana Osteria-Enoteca, Bistro Bis, Blue Duck Tavern at the Park Hyatt, Bombay Club, Cafe Dupont, Charlie Palmer Steak, City Tap, Clyde's of Georgetown, Clyde's of Gallery Place, Degrees, Firefly, The Grill Room, The Hamilton, Hill Country Barbecue, iCi Urban Bistro, Jardenea, Juniper, Lupo Verde, Nage Bistro, West End Bistro, The Tavern at the Henley Park Hotel, Taberna del Alabardero, nopa Kitchen + Bar, Old Ebbitt Grill, Oval Room, P.J. Clarke's, Plume Restaurant, Station 4, Teddy & the Bully Bar, and Willard Room. From National Harbor to Potomac, Chevy Chase to Rockville, the Capital Region of Maryland features plenty of exciting fall activities, attractions, and festivities over the Thanksgiving holidays. While a little more residential than Washington, this area of Maryland is home to many top-rated restaurants, several of which will be open for the holidays and serving up a special Thanksgiving feast. 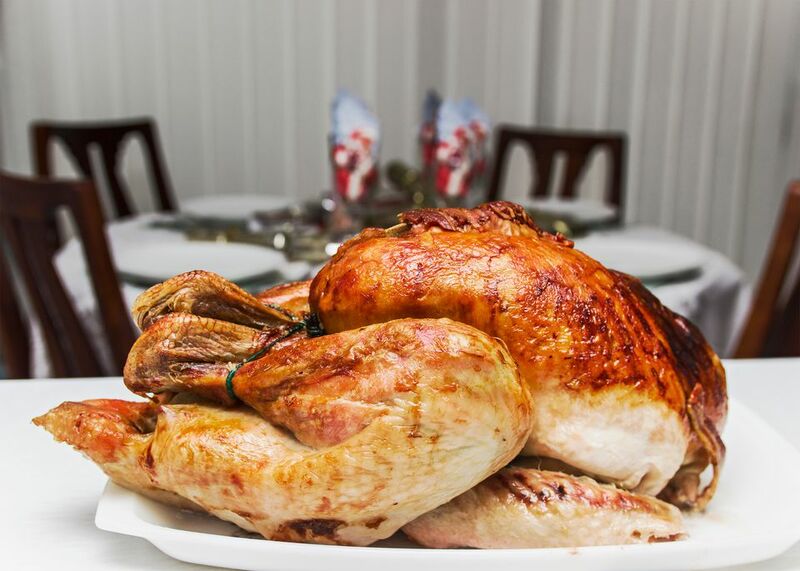 Clyde's: With locations in both Chevy Chase and Rockville, you can enjoy a traditional turkey dinner with all the trimmings on Thanksgiving at this regional chain. However, if you're looking for an elegant yet rustic setting for your holiday meal, you'll want to book a table at Clyde's Tower Oaks Lodge in Rockville. Comus Inn at Sugarloaf Mountain: On Thanksgiving, you can enjoy a holiday buffet complete with herb-seasoned stuffing, oven-roasted roasted turkey, and a wide selection of desserts at this cozy restaurant in Dickerson, Maryland. Maryland Live! Casino: If you want to press your luck this holiday season (but not on your Thanksgiving feast), you can head to one of this casino's restaurants in Hanover, Maryland, for a huge lineup of holiday specials. At Maryland Live! you can stop by The Prime Rib which offers a three-course prix fixe menu, or head over to the Live! Cafe for a fall heritage Thanksgiving buffet full of traditional favorites. Mrs. K's Toll House: Head over to Silver Spring, Maryland, for a classic holiday buffet in this historic country inn. With oven-baked turkey, holiday ham, sausage-and-herbs dressing, and plenty of other seasonal sides, the food at Mrs. K's buffet truly tastes like home. Old Anglers Inn: - 10801 MacArthur Blvd. Potomac, MD (301) 365-2425. Celebrate the Thanksgiving holiday by a crackling fire at a charming country inn in Potomac, Maryland. Old Anglers will be serving up a three-course prix fixe holiday menu complete with locally-sourced ingredients and a choice of entrees, desserts, and starters. Old Hickory Steakhouse: Located in the luxurious Gaylord National Resort in National Harbor, Maryland, Old Hickory will be serving up a four-course prix fixe menu on Thanksgiving this year. You can feast on roasted turkey, prime rib, family-style sides, and a selection of desserts while enjoying breathtaking views of the Potomac River. Pienza: Also located in the Gaylord National Resort, Pienza will be serving a Thanksgiving Day feast including brunch favorites, a carving station, a market buffet station, a dessert table, and a full salad bar. Normandie Farm: You can enjoy an elegant holiday dinner buffet in this charming Potomac, Maryland restaurant. Known for its unbeatable prices, charming atmosphere, and farm-to-table ingredients Normandie is a great destination if you feel like getting away from it all this holiday season. Positano Ristorante: For an Italian twist on a traditional Thanksgiving lunch or dinner, you can head to this locally-owned restaurant in Bethesda, Maryland. During the week fo Thanksgiving, Northern Virginia celebrates the season with a variety of community-oriented events including charity runs, free holiday meals, festivals, and even a few parades. Luckily, if you don't want to miss any of the action and still want to enjoy a full holiday feast with your family, several restaurants in Falls Church, Tysons, Alexandria, and the surrounding area will be open on Thanksgiving Day. 2941 Restaurant: This Falls Church restaurant offers a festive three-course holiday meal with a waterfront view of Fairview Lake from almost every seat in the house. American Tandoor: For a bit of a foreign flair to your traditional holiday meal, you can head to American Tandoor in Tysons, Virginia, for a three-course classic turkey feast flavored with Indian spices. Bastille: This French restaurant in Alexandria offers a three-course, prix fixe menu on Thanksgiving. You can dine in an elegant setting at Bastille this holiday, but be sure to book your table well in advance as this popular spot is likely to reach capacity. Blackwall Hitch: For a truly local experience, you can head to Blackwall Hitch in Alexandria to enjoy a Thanksgiving buffet prepared using locally-sourced ingredients. While you're eating, you'll also be treated to musical performances by Alexandria-based bands all day long. Carlyle Club: This Alexandria venue also offers musical accompaniment to its four-course holiday feast. Head over to Carlyle Club for traditional favorites like sausage and herb stuffing, oven-roasted turkey, and pumpkin pie for dessert. On the following day, you can return to Carlyle Club to see Doc Scantlin and His Imperial Palms Orchestra's performance of "Kick-off to the Holidays" for $35. Fyve Restaurant Lounge: Inside the Ritz Carlton Pentagon City in Arlington, Virginia, the Fyve Restaurant Lounge offers a Thanksgiving brunch or dinner featuring a special holiday menu. This elegant restaurant is relatively close to several tourist attractions, including the Arlington National Cemetary, making it the perfect stop during a family road trip through the sights. Gadsby's Tavern: You can feast on a traditional Thanksgiving dinner at this historic tavern in Alexandria that was once frequented by George Washington and Thomas Jefferson. Traditional favorites get an update on the prix fixe holiday menu of this famous landmark establishment, but be sure to book your table in advance as space is limited. Goodstone Inn & Restaurant: This gourmet restaurant inside a romantic country inn in Middleburg, Virginia, serves a four-course meal every Thanksgiving. Offering perhaps the most comfortable and relaxed dining experience around, you'll certainly enjoy Goodstone's Thanksgiving feast if you're longing for a taste of home this holiday season. Jackson 20: This Thanksgiving, you can enjoy a three-course meal served up with Southern accents in Alexandria's Jackson 20 restaurant. Tyson's at the Ritz Carlton: In McLean, Virginia, you can head over to the Ritz Carlton for Thanksgiving Day brunch featuring traditional holiday dishes and festive brunch classics. Menu highlights include turkey served with apple brine, poached lobster tails, and a chef’s selection of fine-cooked meats. Other Restaurants Open on Thanksgiving in Northern Virginia: Clyde's at Mark Center, Clyde's of Tysons Corner, Clyde's Willow Creek Farm, Laporta's Restaurant (Alexandria), Lansdowne Resort (Leesburg), and Vinifera Wine Bar & Bistro (Reston).